Featuring an expertly faceted round cut, 5.5mm. Total Diamond Equivalent Weight (DEW) 1.12 carats. A wink of sparkle. This Forever One engagement ring showcases a bezel set round cut stone wrapped in 14K gold. 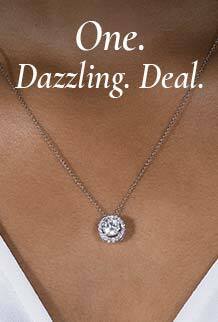 Additional stones flank either side for seriously beautiful glow.